Live blog: What’s happening with Alibaba’s IPO? The big day has arrived, and the Chinese company that 88 percent of Americans have never heard of is making history on the New York Stock Exchange. We’re rounding up all the facts, sass and stories you need to hear as Alibaba’s IPO unfolds. For the business back story and analysis of how its IPO could impact America’s tech scene, check our previous coverage. 1:00 pm pt — Alibaba has closed on the first day of trading with a share price of $93.89 and a market cap of $231.44 billion according to Yahoo Finance and the WSJ. That’s a 38 percent increase from the opening stock price set Thursday at $68 per share. 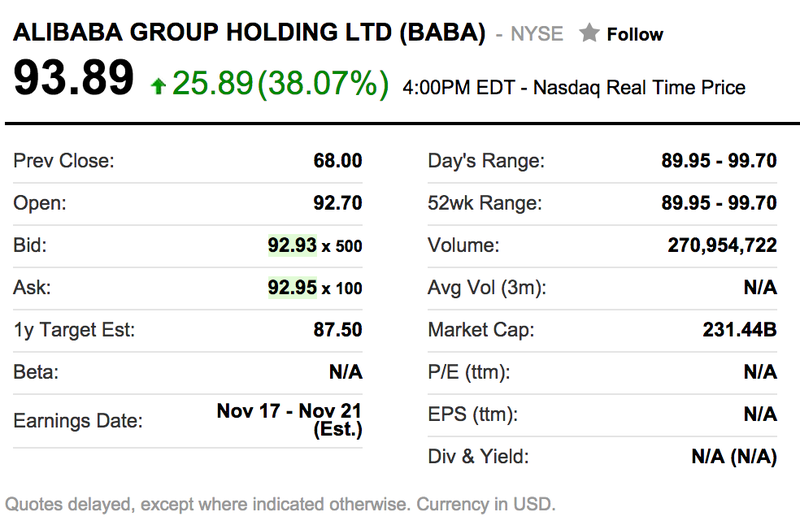 12:57 pm pt — Alibaba is seeing a small surge in the last few minutes of trading. Stock is almost up to $94 per share. 12:36 pm pt: Closing time is nigh and now seems like a good time to take a look at the hype and hope fueling Alibaba’s 30 percent stock price pop. Alibaba will need to increase revenue at about 30% to 35% annually for the next few years to meet analyst expectations. That’s roughly in line with the forecast growth of e-commerce generally, as online shopping leapfrogs over traditional retail. The reasons to avoid Alibaba’s stock are not the usual red flags that surround high-tech companies. This is a company that has healthy fundamentals. That said, there are other aspects of Alibaba and this IPO that should have investors on guard: Corporate governance, China, return on investment, and dividends. I am an optimist and find no real value debating tops and bottoms, but I would not be surprised to see a big correction start soon. I have no skin in that ‘correction’ call other than more cash than usual and a strong network to help me manage the risk of it all. As usual, I do recommend people avoid chasing assets. Take a deep breath as the markets are always going to be there serving up opportunities. 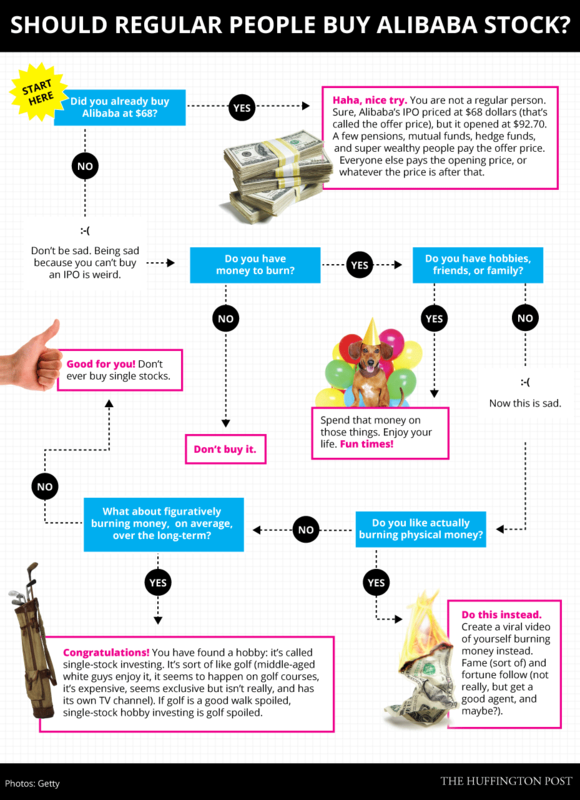 For the layman’s decision tree on whether to buy Alibaba, we have this visualization from the Huffington Post. Reblog ? me telling you to use this. 12:04 pm pt: We’re an hour from closing. The Wall Street Journal has this handy live visualization of exactly how much CEO Jack Ma stands to make based on the current stock price, if he were to sell all his shares. He holds 193.4 million, roughly. 11:53 am pt: There hasn’t been a ton of recent news around the IPO, which seems to be progressing smoothly. So, to tide you over until closing time, here’s an adorable picture of Alibaba CEO Jack Ma ringing the bell with a look of pure joy on his face. 11:41 am pt: Looks like Alibaba has beat Facebook in more ways than one. It’s not only bigger in market cap now, it also had more pre-IPO investor orders than Facebook did, according to stock market broker TD Ameritrade. Not bad for a Chinese company most Americans have never heard of. Meanwhile, Alibaba’s IPO price has lifted slightly to $92.38 per share, within spitting distance of the opening price of $92.70. 11:16 am pt: Bitcoin’s price has plummeted in the wake of Alibaba’s IPO. Here’s our own Biz Carson on the connection. 11:01 am pt: The Wall Street Journal is live from China, covering the celebrations of Alibaba’s former employees in Hangzhou, where the company was founded. It’s night there, so the crew is drinking wine at a local coffee shop and discussing what they’ll do with their stock profits. The excitement is infectious even through print. The green letters continued to climb upwards. They rose to $95.26 and even higher. The revelers rose and began to snap photos of the wall. ‘Who knows if we’ll ever see this number again,’ one said. 10:27 am pt: Stocktwits, the social media site for investors, appears to be back up after the Alibaba IPO rush crashed it. 9:26 am pt: If you’re just checking in on [company] Alibaba [/company] now — welcome West Coasters to the IPO frenzy — here’s the overview. The stock was delayed two hours because of overwhelming demand, one that pushed the price much higher than its initial $68 from Thursday night. It opened at $92.70 a share, hit a high of $99.70, and is now hovering around $93. USA Today is reporting that in the first twenty minutes, the NYSE saw more than 100 million shares traded. Oh, and Yahoo’s stock has unexpectedly suffered — down 5.70 percent according to its Yahoo Finance stock page. 9:04 am pt: Ten minutes since opening, Alibaba’s stock is extremely volatile. Some shares sold north of the $99 mark before plummeting closer to the opening price at $93. 8:54 am pt: And the bell has been rung, with an opening price of $92.70. 8:50 am pt: The WSJ has a helpful post showing the market fluctuations of a handful of public companies with ties — either competitively or as an investor — to Alibaba: Yahoo, Softbank, eBay, Amazon, and online retailer JD.com. 8:47 am pt: CNBC is reporting that the NYSE processed 40x more opening orders for Alibaba than it did for Twitter IPO’s opening. 8:41 am pt: Emily Chang popped a tough question on Alibaba CEO Jack Ma, one he clearly wasn’t expecting. Would he consider partnering with his global competitor Amazon on a joint business venture? ““I would be interested in talking,” Ma replied. 8:32 am pt: It appears we’re a few minutes away from the opening bell. The share price has gone even higher, but not everyone is buying the hype. As $BABA eyes $92-$93 Manhattan Partners Max Wolff warns: "Prices above $79-$81 clearly not warranted, are frenzy based and not fact based." 8:16 am pt: Re/Code’s Kara Swisher is a picture of bubbly excitement on CNBC, talking about Alibaba’s IPO significance for major shareholder Yahoo. 8:06 am pt: Alibaba is creeping closer and closer to that $90 a share price range. Of course, one of the reasons few people seemed excited about Alibaba is that the e-commerce and payments giant is ubiquitous across China—and its import is taken for granted. Even if Chinese early adopters aren’t talking about it, they’re using it to buy everything from clothes to books to food. And investors are betting that tens of millions of people in China, Brazil, Russia and other markets will too. Still, the lack of interest among early-adopters in Alibaba’s home market is worth bearing in mind as investors evaluate the company. It speaks to a major theme: All the attention in Chinese tech is shifting to Android—and in particular, businesses that control or distribute Android apps or services. As Android smartphones grow, these companies are seen as the as rising powerhouses and gatekeepers. 7:43 am pt: CNBC is reporting that the price has moved to $84 – $87. Here’s the view from the floor as everyone eagerly awaits the bell. Looks like business reporters and traders have packed the place. 7:35 am pt: Scratch that, the price has jumped even higher in the auction. Now it’s at $82-$85. 7:09 am pt: Early signs on the NYSE floor show that Alibaba may begin trading at a whopping $80 a share. 6:55 am pt: The climate as Alibaba appears to go public is favorable. Scotland voted to stay part of the United Kingdom, the stocks are up, and the iPhone 6 has gone on sale. Some still think Alibaba is the big news of the day, at least in the States. If you're gonna wait in line for one tech product this morning it should probably be Alibaba stock. A is for Apple and Alibaba. Huge day for two of world's tech giants. Jack Ma at NYSE. Tim Cook swinging open the doors at Palo Alto store. 6:45 am PT: It’s an ominous beginning. Alibaba’s IPO is delayed because the demand for the stock is so high. The opening bell time has been pushed back at least an hour as the NYSE deals with the order imbalances. 6:15 am PT: Here’s where you can watch the opening bell live. The NYSE must be thrilled Alibaba picked it over NASDAQ. I guess NASDAQ is still smarting from Facebookgate of 2012. Yahoo own 540 mil shares of BABA, one share of Yahoo own 0.5 share of BABA worth only $40, and BABA at around $92($46 for half of share of BABA)! What happen to Yahoo shareholders? I like Kara. She is a great tech journalist. Too bad most of re/code doesn’t follow suit. And I like this IPO because bubble IPOs make for great entertainment.